To get to this page, to to Reports → SMTP Usage. 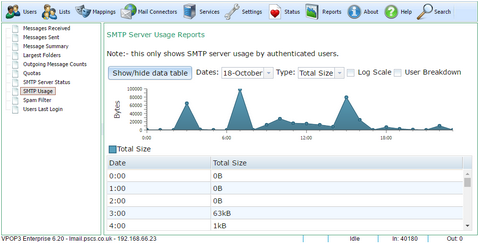 This report shows you a summary of recent SMTP service usage (i.e. sent messages) by authenticated users. 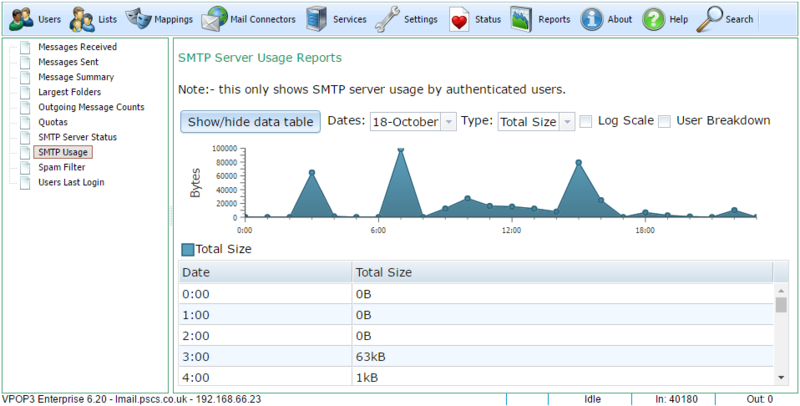 It does not show incoming SMTP messages or unauthenticated users (use the Outgoing Message Counts or SMTP Server Status reports for that information, but it will be less detailed). If User Breakdown is not checked, then this shows a graph of usage against time for the selected date(s). You can choose to show the number of messages sent, the size of messages sent, the number of recipients messages were sent to, or the total of recipients x size for the messages sent. 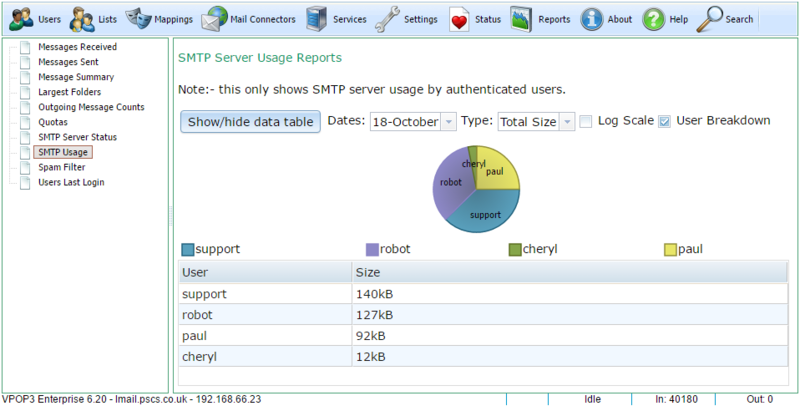 If User Breakdown is checked, then it shows a pie chart of the users' usage for the selected date(s). It does not show the graph against time. Only up to the top 20 users are shown. If Log Scale is checked, then a logarithmic scale is used for the Y-axis, or for the pie-chart segment scaling. This reduces the effect of large differences in value making small values hard to detect. If Log Scale is unchecked, then a linear scale is used. For instance, if the maximum size is 100,000 bytes, then a linear scale may show ticks at 0, 20000, 40000, 60000, 80000, 100000, where a logarithmic scale would show ticks at 1, 10, 100, 1000, 10000, 100000. A value of 100 would be hard to see on the linear scale, but easy on the logarithmic scale. This report does not require Historical Logging to be enabled, but can only display data for the last month or two. Below the graph is a table of data grouped by time/date/user. You can show or hide the table by clicking the Show/hide data table button.